Thanks for visiting my page. Make yourself at home and learn more about McIntosh Lab, Scripto pencils and mystery clocks as well as other subjects. I have been referred to as a renaissance man perhaps due to curiosity about various things and learning more as the truth is often hard to find. This carbon-based unit thanks all those who have voiced their appreciation for these pages and the information they contain. I hope to add even more. What is on These Pages? Vestal, NY. Services and sells McIntosh, including the older tube equipment. Buys, Sells, Trades and Repairs High End Audio Equipment. Take a virtual tour. Knoxville, TN. Restorations, Detailing, Lab Services, Pre-Owned Stereo Components, Cabinets and Faceplates, Specializing in McIntosh. A history of column designs that eventually lead to the creation of my unique wide-range column system. Zobels and the IDS-25 speaker system. It all sounds the same provided the resistance is low enough. My latest page is a combination of humor and hard to find truth in the audio world. Information on speakers and electronics. Request a catalog for lots of speaker books, software, etc. Sound exposure and measurement, hearing loss, hearing protection, hearing aids and update for schools. A slightly odd company with a questionable speaker and even stranger performance. Information on several different designs including the Harman Kardon Citation X, Eico HFS-2 and several others. 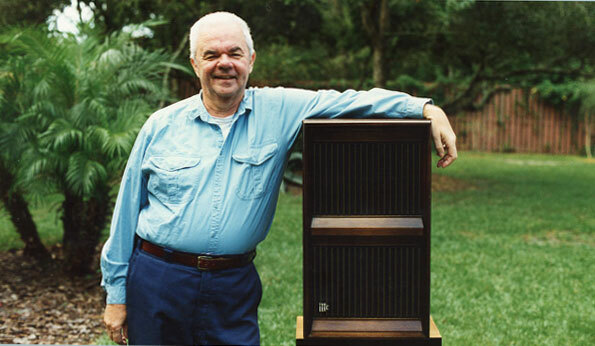 A history of equalization and all of its uses including speakers. Binaural records and a history of Emory Cook, magazine articles and many pictures. I was a senior engineer for 8 years at the Sonotone Corporation, in Elmsford, NY. I designed several compact speaker systems and a wide variety of microphones. Includes a detailed description of the history and products. I am a life member in the AES and joined in 1960. Previously, I was a student member at RPI. A personal voyage of nostalgia for my experiences in my early days with sound and the good old days of high fidelity. Discoveries and photos from personal adventures in my woods. A noontime escape from work. Includes a sequel about The Field. Here are a few interesting rocks that I picked up from various locations. Includes a few fossils and some sand. A history of the Norma Pencil Corporation and a list of the many different pens and pencils they made. Colored leads are for sale in the 1.1 mm (0.047") size. Information about the company and the pencil products they made. The Classic pencils, leads and erasers are for sale. My personal voyage into the world of science fiction. A reference for copper origins, uses and purity ratings. A history of the Jefferson Electric Company including many mystery clocks and other products. Lots of pictures and text. The Dutch Secret, Etalage, Etalage Reclame, Sonic Industries Inc., Monitor Equipment Corp. MagiClock, Boots Boy and Rex Cole. Includes the Golden Secret and new battery operated mystery clocks that Jan designed. A history of Westclox clocks and watches and a history of Telechron, Seth Thomas and Standard Electric Time Company clocks. Includes a large number of links. Questions about the IDS-25 system are answered on my FAQ page. More text and pictures will be added to these pages as my research continues. Any comments, corrections, or additions are welcome. whole or in part without written permission of the author.